WinTik – UserBase Technologies Inc.
Guaranteed to meet all government reporting requirements. WinTik 3.0 takes full advantage of the Microsoft Windows platform and provides unprecedented ease of use, power and flexibility. WinTik will drastically improve the efficiency of your ticket processing and will ensure tickets are posted correctly. 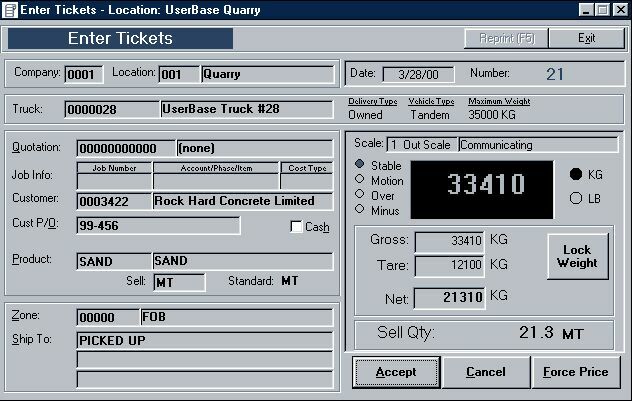 With WinTik, your scale operators will be able to process tickets as fast as trucks can drive over the scale. With a direct capture of weights from the digital indicator you can rest assured that all tickets will correctly reflect the weight of each load. Because the system remembers all pertinent information from each truck’s previous load, typing in the truck number and accepting the weight is all that is required to process most tickets. You will have a printed ticket only seconds after the truck arrives on the scale. Exporting of the daily ticket file allows you to send ticket information to your accounting system for timely and accurate billing. Ticket export is adaptable to suit any accounting and billing system. Our Office WinTik Billing Module is tightly integrated though remote replication. • Sales by customer, product, day, order, truck etc. 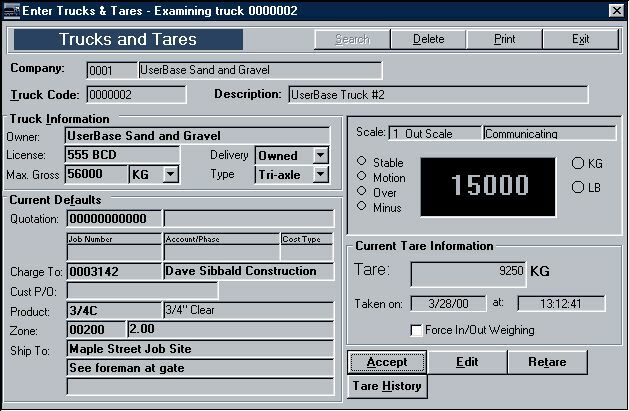 • System remembers details of each truck’s last load and automatically fills in screen. Just hit accept to print ticket! • Maximum weight stored for each truck to prevent overloads. • Screen shows most recent tare and when taken. • Linked to scale for automatic reading of tare weight. • Keeps information from last load as defaults for next load to speed up ticket entry. • Current defaults can be edited as trucks tare in so that they can weigh out faster. • Tare history is stored for reference (as required by various government agencies). 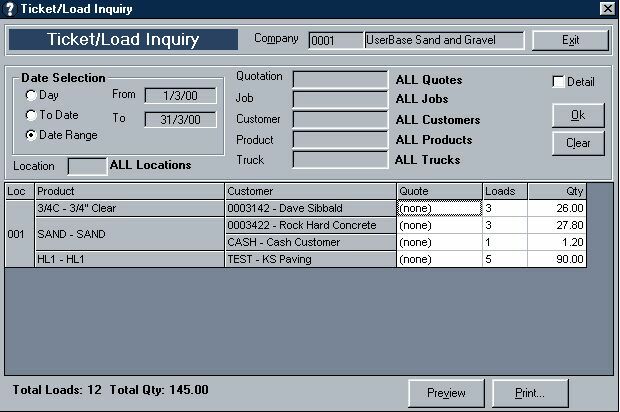 • Inquire on loads by day, to-date, or a range of dates. • Select specific customer, product, quote, or all. • Drill down to see ticket detail by clicking on any line. • Always shows total number of loads and total quantity for search criteria selected. • Inquiry can be as broad or as specific as desired.